Bargain hunting and lower crude oil prices lifted the key Indian equity market indices by around 1 per cent on Friday. The day's gains come after a three-day losing streak, with the S&P BSE Sensex closing over 360 points higher. The rise in the market was boosted by a surge in banking stocks, analyst said. The S&P BSE banking Index closed 485.24 points higher. Index-wise, the Nifty50 on the National Stock Exchange (NSE) ended higher by 93 points or 0.87 per cent at 10,693.70 points. The Sensex closed at 35,673.25 points, up 361.12 points or 1.02 per cent, against the previous close of 35,312.13 points. It opened at 35,494.86, and touched an intra-day high of 35,730.05 points and a low of 35,378.27 points. In the broader markets, the BSE Mid-cap rose 0.23 per cent, while the BSE Small-cap was down 0.27 per cent. The BSE market breadth was in favour of declines with 1,499 declines against 1,079 advances during the day. The rest 145 stocks on the BSE remained unchanged. "Markets were largely propelled by bargain hunting as investors continue to stay cautious ahead of the exit poll results of five state elections due after market hours today (Friday)," said Abhijeet Dey, Senior Fund Manager-Equities, BNP Paribas Mutual Fund. "Sectoral performance on the National Stock Exchange (NSE) was mixed. While the banking and financial services indices registered sharp gains, the metal and information technology indices closed the day in the red." According to analysts, a drop in crude oil prices also buoyed investors' sentiments. On Friday, the Brent crude oil price fell below the $60-per-barrel mark and traded at around $59 per barrel. Oil prices fell after the Organisation of Petroleum Exporting Countries (OPEC) delayed the output-cut decision on Thursday as it awaited support from Russia, a non-OPEC major oil producing country. "Domestic market rebounded today (Friday) along with global market which has lightened up, hoping for a resolution of US-China trade war," Geojit Financial Services' Head of Research Vinod Nair said. "OPEC's decision to delay the final resolution to cut oil output caused prices to fall, boosting sentiments in India." On the currency front, the rupee settled at 70.80 per US dollar, strengthened by 10 paise from the Thursday's close of 70.90. Selling by Foreign Institutional Investors (FII) continued on Friday with a total of Rs 817.40 crore worth scrips sold by FIIs, while Domestic Institutional Investors (DII) purchased scrips worth Rs 242.56 crore, provisional data from the BSE showed. Among the sectors, other than banking, auto and capital goods stocks witnessed healthy buying through the day's trade. The S&P BSE capital goods index rose 171.72 points and the S&P BSE auto index ended 156.38 points higher. On the other hand, the S&P BSE oil and gas index fell 85.32 points, the metal index fell 60.48 points and the healthcare index was down 19.68 points. Kotak Mahindra Bank was the highest gainer as its share price rose 8.53 per cent or Rs 100.75 per share on the BSE Sensex to Rs 1,282.25. Its stock price jumped amid reports of Berkshire Hathaway Inc buying a stake in the bank. 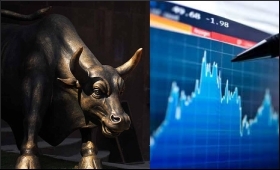 The other top gainers on the Sensex were Adani Ports (up 2.71 per cent, at Rs 373.75), Bajaj Auto (up 2.23 per cent, at Rs 2,779.75), Infosys (up 1.92 per cent, at Rs 681.05) and Asian Paints (up 1.82 per cent, at Rs 1,318.60). The major losers were Sun Pharma (down 2.09, at Rs 411.30), Coal India (down 1.62 per cent, at Rs 236.80), Yes Bank (down 1.31 per cent, at Rs 166.10), NTPC (down 0.93, at Rs 137.85) and Tata Steel (down 0.62 per cent, at Rs 507.90).